Polyblend grout is a modified grout and comes in a wide variety of colors. Polymer is a complex compound. Without getting too technical about molecular structure, it's basically what engineers use to make many things like plastics. For the average do-it-yourselfer, you'll find Custom Building Products' Polyblend in 48 different colors at home improvement stores like The Home Depot or Lowe's. There are a few things that you need to keep in mind when working with this kind of grout. Here are a few guidelines. Do not use Polyblend if the outside temperature is below 50 degrees Fahrenheit. The cool temperature negatively affects how the grout cures. If it doesn't cure correctly, it is less durable. Choose your colored grout carefully when using this grout around pools. Them chemicals used in the pool and the pool's filtration system affect the color of the grout, particularly blue, green and red. Be sure that the surface is free of any dirt, dust or debris before beginning installation. If you are using Polyblend for an inside installation for joints that are between an eighth of an inch to half an inch wide (such as floors), you have to use sanded grout. For joints smaller than one-eighth of an inch (like countertops or backsplashes)-, use non-sanded grout. Install a backer board. A cement backer board ensures that the surface is able to withstand the weight of all the tiles you are installing. Backer boards also help to prevent the surface from sagging over time. Also keep in mind that when you are working with any sort of porous tile like slate or Travertine, it's a good ideal to use a sealant on the tile before installation because porous materials are very absorbent and stain easily. Here are a few final tips and warnings about working with Polyblend grout that will help the installation process go smoothly. Wear a mask when pouring the dry grout into a container. All Portland cement products are dusty when dry. This dust can irritate your eyes, nose and throat. Pay attention to consistency. 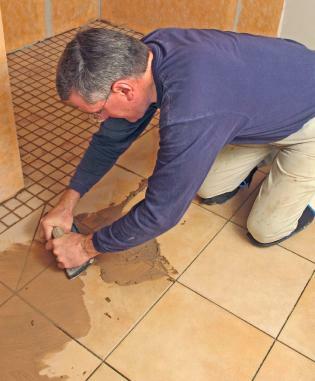 If you mix too much water with the grout, it is less durable and more prone to cracking when it dries. The grout should be the consistency of thick cake frosting or paste. Only mix what you can use within a two-hour period of time. After this, the grout begins to harden and becomes unworkable. Allow the grout to stand for the stated period of time. Usually once the water and grout are mixed together, you need to let it stand for about 10 minutes. This is called slaking. Mix the grout often during the installation process. This helps to prevent lumps from forming. Remember to lightly mist the grout for three days after the installation is complete. This helps diminish shrinkage and also helps to prevent the grout from cracking due to very dry conditions. Use dark-colored grout on dark tiles. Dark-colored grout has the tendency to stain light-colored tiles. Wear gloves to protect your skin. Colored grouts will stain your skin but can also lead to irritation if bare skin is exposed to grout for longer periods of time. Seal the grout. Even though some manufacturer's state that this type of grout doesn't need to be sealed, seal it anyway to further protect the grout from staining. This is especially important in high-use areas like kitchens and bathrooms.